Will history be kind to Bush? Editor's note: Timothy Stanley is a historian at Oxford University and blogs for Britain's Daily Telegraph. He is the author of the new book "The Crusader: The Life and Times of Pat Buchanan." The opinions expressed in this commentary are solely those of Timothy Stanley. Thursday afternoon, Barack Obama presided over the unveiling of George W. Bush's official portrait in the White House, a warm event that reminds us: It feels like years since President Dubya regaled the world with his famous spoonerisms. His retirement has been defined by an awkward silence. While John McCain's endorsement was trumpeted by Mitt Romney, Bush delivered his in just four words. "I'm for Mitt Romney," he shouted to a journalist as an elevator door closed between them. If, just for old time's sake, Bush had said, "I'm for Ritt Momney," it would have been perfect. Bush's silence may be motivated by the recognition that much of the public doesn't like him. He left office with the worst approval rating for a president since Watergate. But Bush could undergo a renaissance of enthusiasm. Consider the shifting attitudes toward Harry Truman. When he left the White House in 1952, Truman was blamed for the recession and an ugly war in Korea. His approval rate was just 31%. By 1977, Jimmy Carter was hanging Truman's portrait in the White House and the band Chicago sang, "America needs you, Harry Truman!" The switch came partly because Truman, like Bush, had a gentle, honest personality that voters looked back on with fondness. But Truman also proved prescient in his conduct of the Cold War. Bush, likewise, might seem a better and more farsighted leader in a few years time. But not yet. In the short term, the two things that will dominate popular memories of Bush are the credit crunch and the Iraq War. Read more about why Bush's time in office might start to look comparatively benign. I didn't vote for either Bush or Obama, nor am I really a fan of either. 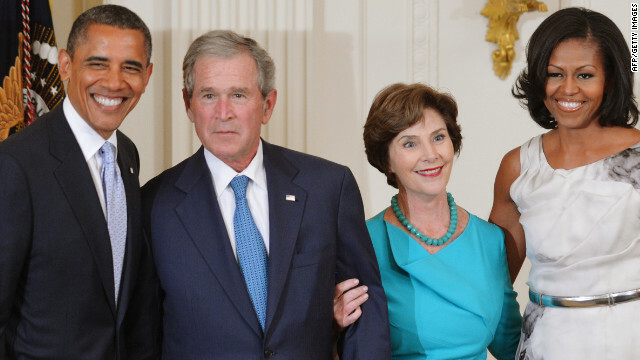 That being said, George and Laura are a class act, especially when compared to the crude, classless, clueless Barry Obummer and the Mooch , who are fit to kiss the feet of the former. With out a doubt, history will have to tell the whole truth, unlike the Bush Admin. He and Cheny were liars, which in politics is common, BUT to take us to war, on lies, that was the worst of his Admin. I hope he never gets a moments rest till he dies, seeing all the faces of the fallen Americans HE put into an unjust war. They got fat and rich off the wars, now the GOP wants to give the 1% MORE taxs breaks, where does their greed end? the lying historians, many of those, will be more than generous. Oh really, well let me see: He crashed our economy, threw us into a pointless war and was generally a puppet to Cheney and big business. Bush was selected to be president so an agenda that was decided by certain groups and countries could take place. That agenda was trumped by Murphy's Law and the American people and the world have had to pay. Much of the recent US history since WWII remains very murky. The people could probably not be able to face the actual truth. The Two George Bushes were Great American leaders. Their True American love and legacies, will be remembered, forever. Don't you know that republicans don't believe in God and the teachings of Jesus. You know....the part about feeding the hungry, sheltering the homeless, curing the sick, assisting the elderly, and giving to the poor!!!!!!! HOW? The man should be in prison!!! He's a murderer worse than Bin Laden. Can someone name one positive thing bush ever did for the USA? He collapsed the world economy through deregulation, and got you entangled in 2 wars that have bankrupted the country. Ohhh, and the reputation of the USA went down the toliet big time under his leadership. bush the terrorist and traitor, the war criminal and serial murderer. If there is a God, this blood clot will forever burn in hell with the minions that voted for him.